Kenyan ambassador to the US, Mr Elkanah Odembo last week led Kenyans living in the US in signing a peace pledge committing themselves to maintain peace during the forthcoming general elections. Launching the peace charter in Boston Massachusetts, during a dinner party hosted in honor of the Kenyan athletic team that participated in the Boston Marathon, the ambassador said there were already signs that trouble was brewing. “As a country, we are still not cohesive. 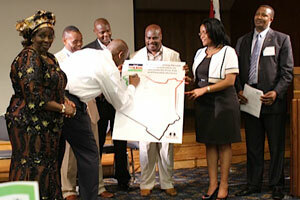 As soon as 2012 arrived, tensions among different Kenyan communities in the US started rising. Things started bubbling up,” he said. Odembo said it was shameful that the Diaspora, a group that was supposed to show leadership by influencing positive changes in Kenya was itself practicing ethnic and tribal division. “For some of you who have lived here for 10, 20 years and you still live in your tribal cocoons, as long as I’m here, I’ll always be on your case. I’ll not forgive you. We can’t build a cohesive country when we still identify ourselves by our tribes,” he said. Speaking at the same function, Bishop Joshua Wambua said the best thing the Diaspora could do was to indicate to people back at home that Kenyans living abroad are committed to peace and the best way to do that was by them signing the peace pledge. “Before we do anything. Before we discuss the Diaspora policy, we need to start a peace initiative here and now by signing this pledge,” he said. The peace pledge that commits the diaspora to advocate for free, fair and peaceful elections will be taken to different states in the US and Canada that have a large number of Kenyans. The next stop on its journey around the US will be in the Washington, DC Metro area. “We are in the process of identifying an appropriate venue for this purposes. So far, we have already constituted a committee to work on this because we believe the Diaspora can lead peace initiative in our country,” said Bishop Paul Mulani of Maryland. Meanwhile, ambassador Odembo will be hosting a reception in honour of the visiting Government officials attending the Spring IMF/World Bank meetings and the members of the Independent Electoral and Boundaries Commission (IEBC). The meeting will take place today (Friday) at the embassy offices in Washington, DC. The officials include: Mr Robinson N. Githae, Minister for Finance, Charity Ngilu, Minister for Water and Irrigation, Dr Romano Kiome, PS, Ministry of Agriculture and Prof Njuguna Ndung’u, Governor, Central Bank of Kenya. Others are Dr Geoffrey Mwau, Economic Secretary, Ministry of Finance, Mr Jackson Kinyanjui, Director, External Resources Department, Ministry of Finance, Mr Issack Hassan, Chairman, IEBC, Ms Lilian Mahiri-Zaja, Vice-Chair, IEBC and Yusuf Nzibo, Commissioner, IEBC. Mr Hassan is also scheduled to meet with Kenyans on Saturday, April 21, 2012 in Washington D.C. The meeting will be held between 4 p.m and 6 p. m at The Dupont Circle Hotel, 1500 New Hampshire Avenue, NW Washington, DC 20036. This entry was posted on April 20, 2012 at 8:27 AM	and is filed under Kenya. You can follow any responses to this entry through the RSS 2.0 feed. Both comments and pings are currently closed.